Enjoy the songs that inspired generations, performed to perfection by Gina, with Patsy Cline's sound recreated with heartfelt warmth and style that will impress even the most dedicated Patsy Cline fans. Gina has been singing the hits of Patsy Cline for many years to audiences that have demanded having her back time and time again. A professional vocalist, Gina scores high marks for her recreating that special sound of Patsy Cline. 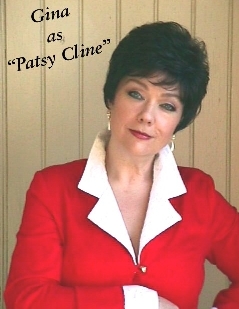 From the large halls to the more intimate settings, the magic of Patsy Cline's songs entertains audiences of all ages.....Gina's show is sure to be a hit every time! Gina says "Patsy's music touches people wherever I perform. It's so nice to be a part of keeping her sound alive...from one Virginia girl to another." Gina is available nationally. . . Book her now, while dates are open.